Union Terminal is ready to greet visitors after undergoing the first full structural restoration in its 85-year history. This image from before work began shows rusted window frames and failing brick work prevalent around the building. Dirt and aging on the building's exterior is evident in this image from February 2016. 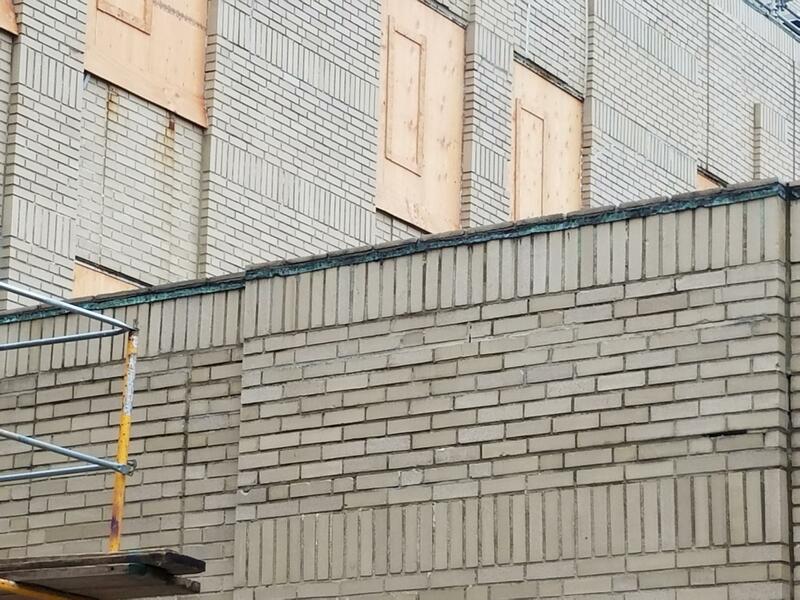 All the exterior masonry has been cleaned and repointed. The official restoration "groundbreaking" took place on a hot July day in 2016. A temporary lobby was erected to allow work to happen in the rotunda and Natural History and Cincinnati History museums while keeping the Children's Museum open. All of the front windows were removed, cleaned and repaired, and reinstalled, as evidenced in this January 2017 image. Nearly every space inside the museum has been transformed. This space (from May 2017), which once housed the flatboat display adjacent to the Public Landing, now permanently houses the Duke Energy Holiday Trains. The red arrow in this October 2017 image indicates the back wall of the Omnimax Theater, which had to be replaced. It's about 40 feet tall, 100 feet wide, 20 feet off the ground, and 15 feet away from an active rail line. Eight 12,000-pound steel beams were lifted into place from below rather than lowered from above. The beams were installed above the Children's Museum to help support the front plaza and driveway. The originals were compromised by 84 years of water damage. Museum Center officials had known for years Union Terminal needed major repairs. Work done in the early 2000s wasn't enough to maintain the iconic building for another hundred years. Fast-forward to Nov. 2014 when taxpayers approved a five-year, quarter-cent sales tax for restoration, and in exchange, the museum's operating levy went away. "From the fall of 2014 to the fall of 2018, it has been non-stop," says CEO Elizabeth Pierce. Design work began immediately. There were a million questions to consider, not the least of which is what to do with the museums' vast collections. "The Curate My Community initiative to move things out into the community was driven by the necessity of having really large spaces for very large objects. It's hard to find a place to put a mastodon," she laughs. While artifacts were finding new homes, architects were finding new challenges. The drum wall holding up the rotunda was pulling away from the building and would have to be fixed. Turner Construction Senior Project Manager Steve Swisher says that led to a few sleepless nights. 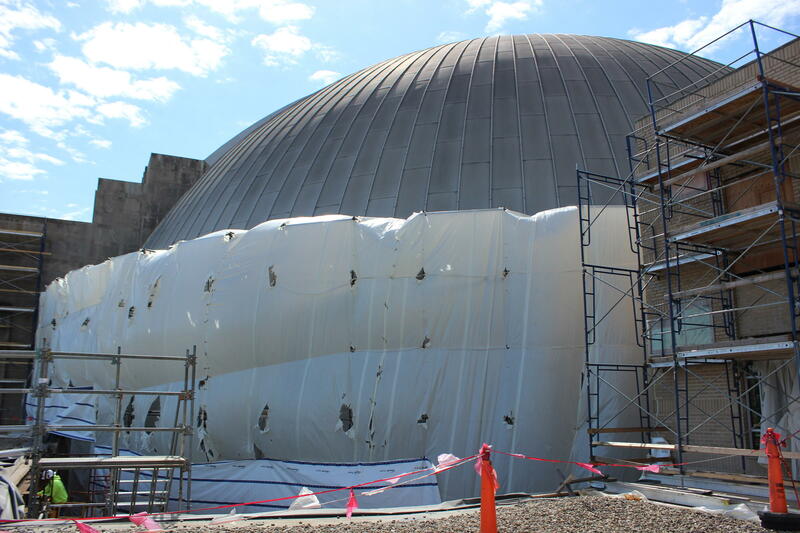 "You've got everybody a little tense when you've got the back side of the dome murals essentially opened up to Mother Nature, but you're protected by several layers of plastic wrap, Tyvek, you name it, to try to keep the weather out." Rain and water have long been the biggest enemies for the Hall of Justice. 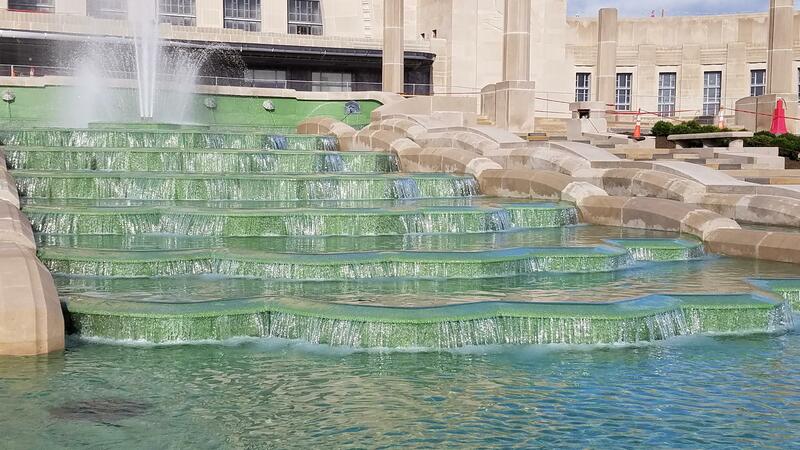 "The biggest goal of the project was to make the building watertight and to preserve the building for the next 100 years," says GBBN Project Architect Nick Cates, who fell in love with Union Terminal as a kid. All these years later, he's delighted to be part of the team restoring this iconic building. "All the mechanical, electrical, plumbing systems have been upgraded and we've introduced new data systems, fire alarm … pretty much anything mechanical has been upgraded," he says. That included vast exterior work like roofing and masonry. Specialized tradespeople were needed to restore certain areas using historical methods and materials. Water damage was one of the biggest issues corrected during the renovation. In this image from January 2017, you can see where the copper flashing has taken water damage, in turn leaking down into the brick seams and causing rust around window frames. This has all been corrected. The front plaza and fountain were removed so crews could waterproof the museum spaces below. And in a major feat, the west wall behind the Omnimax was rebuilt while standing just 15 feet from an active rail line. "We didn't do every single thing that the team wanted to do, it's just not possible with the budget we had," Cates says. "During the design process, each phase we would get the project priced – the drawings priced – and then scale back a little bit." "There's always more that can be done, right?" Swisher adds. "It's just like your house. You walk around your house and go, 'If I had more money I would do this.' "
The fountain was rebuilt to protect the museum spaces below from water damage. Bright green terrazzo replaces the sea foam pool lining and the rebuilt weirs now cascade more evenly. The restoration is coming in on time and on budget. The project started at $212 million but is topping out at $228 million. The extra funding comes in the form of additional historic tax credits and better-than-expected returns on federal historic tax credits. It's also being held up as a model for other communities on how to restore historic buildings in their own communities. The chair of the Union Terminal Restoration Advisory Committee believes it proves Hamilton County can pull off large capital projects using public/private partnerships. "Every five or seven years we should be able to do a big project like this," John Silverman told WVXU. "We should be able to build new arenas, we should be able to build new bridges and do new infrastructure things." Extensive preparation meant problems like the drum wall were known in advance, but one of the most complex projects was a surprise. Massive steel beams between the plaza and Children's Museum were more damaged than expected. Replacing them meant closing the Children's Museum, which was supposed to remain open throughout construction. "Actually, I think I made that recommendation," Michael Burson says with a little laugh. Burson is the owner's representative, meaning it's his job to coordinate between the museum, the contractors, and the architects. "That was a tough call but it wasn't a hard call after seeing the conditions we saw." "Well, my first reaction was 'No. We have to keep it open,' " CEO Elizabeth Pierce remembers. "Then we walked through the reality and the complexity of the work that needed to happen on the mezzanine above the Children's Museum and how that would impact the visitor experience inside the Children's Museum. We were kind of joking around a little bit that that was maybe more interactivity than we really thought was appropriate." Eight steel beams, each weighing 12,000 pounds, had to be strategically lifted into place from the inside, rather than lowered with a crane from the outside like a normal construction job. Though a disappointment, Architect Nick Cates sees the closure as a blessing in disguise. "They were able to get a lot of other things done more quickly than … they would have had to phase differently if the building was open. They said, 'Well, while it's shutdown, let's do all the work in here and get that done rather than spread it out at nights or some other time,' " he says. "Every cloud has a silver lining so they were able to take advantage of that time." By October 2017, the front plaza and fountain had been removed in order to waterproof the museum spaces below. Each piece of limestone was tagged and stored to be cleaned and placed back in position. The museum will spend the next few years bringing exhibits back online and creating new ones. That work is privately funded. "Lots of people are excited to see Union Terminal reopen and they say to me 'Oh, aren't you so happy that it's finished?,' " Pierce says. "I smile and I say, 'Thank you, yes.' But we are on mile two of a 26 mile journey. 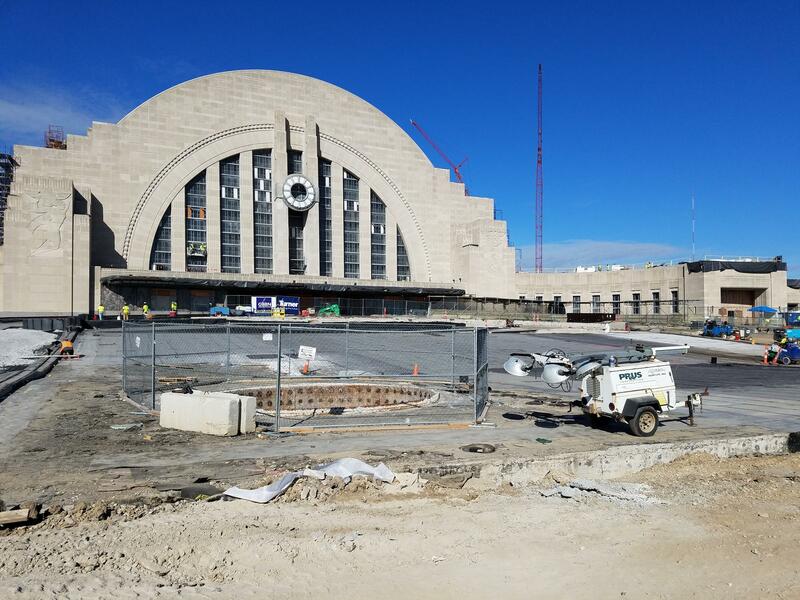 Fixing Union Terminal is really the catalyst that allows Cincinnati Museum Center to be relevant to the community for the next 100 years." Looking back, those who worked on this restoration feel privileged and proud. Many knew family members who traveled through the train station back in the day or joyfully greeted loved ones home. Project Manager Steve Swisher remembers watching the long line of cars waiting to get into Holiday Junction the Christmas before construction began. "It was just one of the moments where you go 'OK, this building really means something to this community.' It's hard to put into words what that means to be involved with." Owner's Representative Michael Burson says visitors should expect to have their jaws hit the floor. 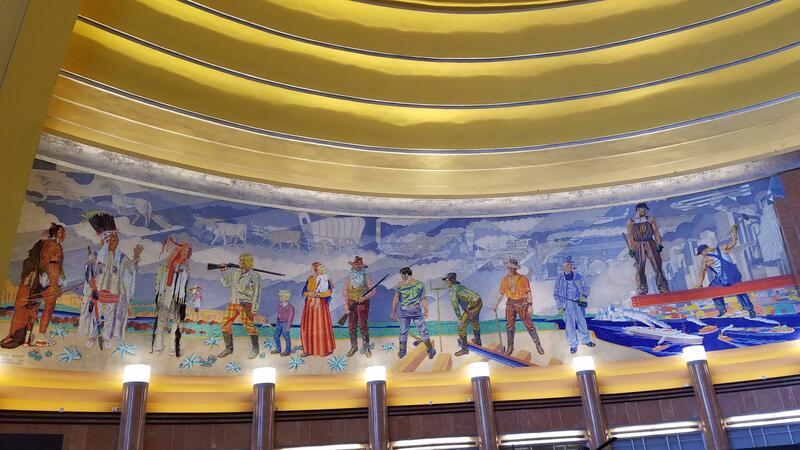 "It's such a spectacular place, and when you walk into it - I'm not a native Cincinnatian – but just hearing the stories of people whose father went off to war or something, it's an emotional space and I'm pretty sure we'll bring those emotions back out." Freshly cleaned, the Winold Reiss murals pop and glow under new lighting allowing fine details stand out. The public can get its first look at the new galleries and exhibits at the homecoming and ribbon cutting that takes place Saturday, Nov. 17 at 10 a.m.
Click the slideshow at the top of the page to see all of the changes and how the restoration unfolded.